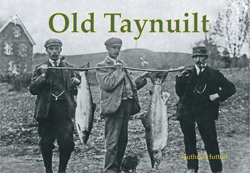 Located at the western entrance to the narrow Pass of Brander on the rugged West coast of Argyll and Bute, the village of Taynuilt was for centuries a staging post and resting place for travellers heading across Loch Etive to Bonawe. In 1753 industry came to the village in the shape of the Bonawe Iron Furnace, constructed by the Newland Company. It stood just to the north of the village, between the rivers Nant and Awe and in 1761 is reputed to have produced 42,000 cannon balls. The photograph collection here more than does justice to the scenery and the history is ably detailed by Guthrie Hutton's captioning.